The Referendum’s tomorrow. We’ve all heard the arguments from both sides, and although we think the EU is far from perfect, we at unionstogether strongly believe that we are all better off IN Europe. 1. JOBS. Many people’s jobs depend on the trade that Britain does with Europe. Leaving the EU would destabilise our economy and put these jobs at risk. 2. RIGHTS. Lots of our rights at work, such as paid holiday and maternity leave, are guaranteed by Europe. Leaving the EU would leave our rights at the mercy of a Tory Government and put our rights at risk. 3. PAY. TUC research indicates that leaving the EU will lower wages by an average of £38 a week. Leaving the EU would put our pay at risk. These three things are so important to all of us, and unionstogether believe that because of jobs, rights and pay, we’re better off in Europe. 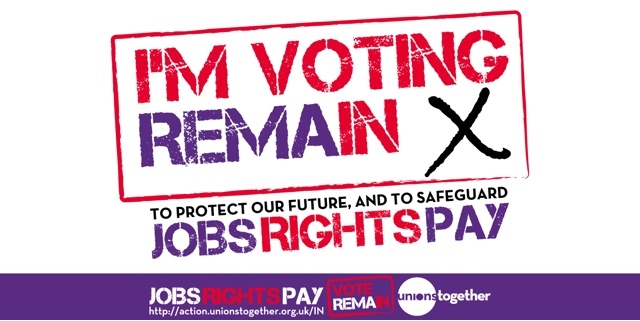 Tomorrow, I’m voting REMAIN for better jobs, for rights that are safeguarded, and to protect our pay. I hope you will too. Reproduced from an electronic communication sent by Helen Pearce on behalf of TULO, both at Southside, 105 Victoria Street, London SW1E 6QT.